A five man US fire team out of firebase Aries, Vietnam, deploys deep into the jungles near the Cambodian border to investigate the sudden silence of a deep listening post.A Chinese American infantry grunt follows his squad and the questionable leadership of a battle-worn Sergeant who sees him as one of the enemy into a dark, seeping tunnel system crawling with Viet Cong guerillas and the interred bodies of their dead. A deep cover CIA agent, posing as a newsman, accompanies a jaded starlet on her propaganda junket to Cambodia, only to turn his attentions to his true mission as assassin in Vietnam. An untried Captain assumes leadership of a beleaguered firebase on the edge of “Indian Country” during one of the most explosive periods of the entire Vietnam conflict. Side by side with the camp’s alcoholic surgeon, he will hold the line and defend his tiny island of resistance against threats anticipated and unbelievable. All these disparate stories and the people who lived them will converge on February 13, 1968…the day when hell gave up its hungry dead and a whole new war began. 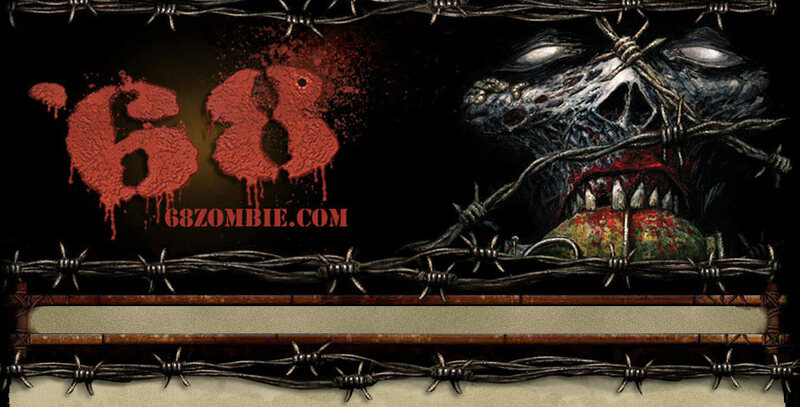 Zombies in Vietnam…what a concept! No –brainer, right? Wrong. In 1968, George Romero, John Russo and Co. created their seminal horror masterpiece, “Night of the Living Dead”. The film, shot on grainy documentary stock on a shoestring budget and boasting not only a central female lead but also a black male lead, pushed every boundary of the times. Armed with its thinly veiled social commentary, horrific concept and an army of flesh eating ghouls, the little film tore its way onto theatre and drive-in screens across America, giving birth to a new (and seemingly) eternal sub-genre. Almost overnight, the shambling, mindless Haitian stooges of previous zombie films and legends were gone. The drooling, clawing, insatiable cannibalistic dead were here to stay. Lots of things. But the one thing…the biggest thing…the thing the world was reeling from and still dissects in minute detail to this very day…was Vietnam. 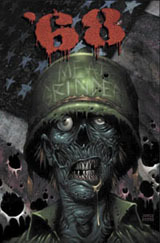 Small-press publisher Chazz DeMoss, who had published the mini-series Mark had just completed helped pull together and introduce Mark to the creative team of Nat Jones and Jay Fotos, and ’68 was born. Fast forward to 2006… where ’68 finally found its way into the hands of horror and comic fans everywhere. Published by Image Comics, ‘68 received rave reviews and quickly became a cult favorite by fans and critics alike. Since the one-shot’s initial release, ’68 has been a top seller. Fans nation and worldwide have come to every member of the team to have copies signed, zombie sketches drawn and questions answered. The number one question from ’68 fans? “When are you going to do more?” For four long years, as each of the creators handled dozens of other non-related projects and books, the answer was a mere shrug of the shoulders. Mark Kidwell is the author/illustrator of dozens of comic books representing genres from horror to western to sword and sorcery heroic fantasy. His work has been published by Image Comics, Fangoria Magazine, Cryptic Magazine, IDW and others. He has written multiple screenplays including BUMP, based on his splatterpunk comic series from Fangoria Comics. BUMP is in pre-production as a motion picture, and his full prose novel based on the story will be published in 2010. In 2009, Mark began designing special FX makeup and creatures for Robert Kurtzman’s Precinct 13 Entertainment group, working on projects from such horror luminaries as Stuart Gordon, Dee Snider and Don Coscarelli. Mark considers his collaboration with co-creators Nat Jones and Jay Fotos on ’68 a high water mark in a career of producing dark, intelligent horror fiction. Nat Jones is one of the industry’s top horror artists and has lent his talents to an impressive array of titles alongside many of today’s most recognized creators including Guillermo del Toro, Steve Niles, Rob Zombie, Jovanka Vuckovic, Joe Hill and Todd Mcfarlane. Working primarily in motion pictures and comics, Nat’s credits include 28 Days Later, 30 Days of Night, Spawn, Frank Frazetta’s Death Dealer, The Nail, The Devil’s Rejects, Fear the Dead and the original ’68 one-shot just to name a few. Known for his dark and moody pen and ink work, Nat has also established himself as an accomplished painter and horror writer. Jay Fotos has worked with nearly every major comic book publisher on hundreds of projects for more than a decade. To name a few, from Spawn to Beowulf, Transformers to Clive Barker’s The Great and Secret Show, Rob Zombie’s The Nail, Sam and Twitch, 30 Days of Night and the Eisner nominated series Locke & Key. Not limited to just the comic medium, Jay also works in other creative media, ranging from animation, video games, album art, TV, motion pictures, and toy design. In 2006, Fotos and fellow collaborator and friend Nat Jones founded Frazetta Comics, and along with writer Joshua Ortega, created the #1 selling Image Comics title for 2007, Frank Frazetta’s Death Dealer, also holding a record for the fastest sellout for issue #1 in 6 hours! With the success of the Death Dealer series, and by keeping true to the Frazetta name and legacy, helped launch a new variety of Frazetta inspired comic titles and hard cover books like Swamp Demon, Dark Kingdom, Neanderthal, Moon Maid, Freedom, Creatures, Dracula Meets the Wolfman, Sorcerer, Frazetta’s Death Dealer: Shadows of Mirahan Collected Slip-cased Edition and The Fantastic Worlds of Frazetta Volumes One & Two.